At the superb open-air photo exhibition of 44 photographs, albeit mislabeled "alta cocina" instead of cocina de vanguardia (avant-garde cuisine), with creative pictures of some of Spain's top chefs and their dishes on calle Larios in the old quarter of Málaga during the Málaga Gastronomy Festival, May 4-7, 2017. In the foreground right is Catalan Chef Albert (Tickets, etc., Barcelona) and left Chef Andoni Aduriz (Mugaritz, near San Sebastián). Photo of the photo exhibition, copyright 2017 by Gerry Dawes. 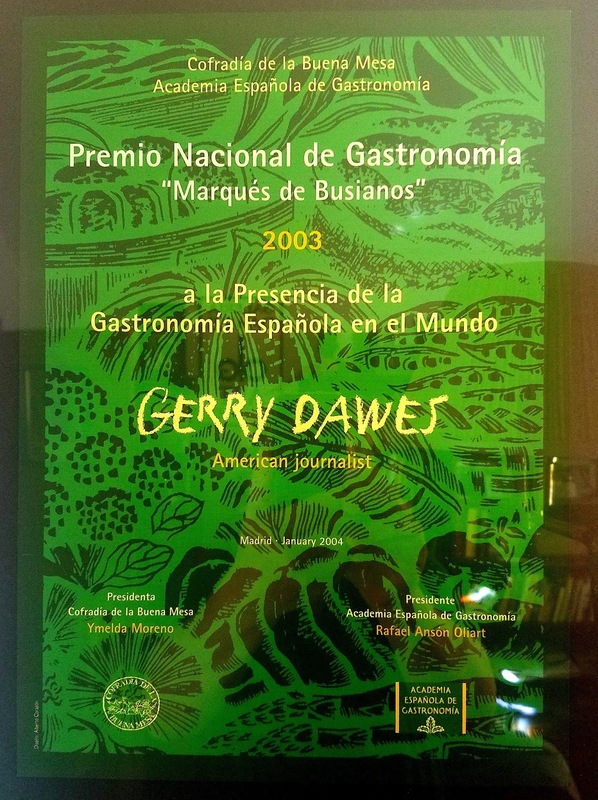 When I received an invitation to attend the Málaga Gastronomy Festival in early May, I booked my flight from New York to arrive a day or two earlier than the rest of my media fellows, since group therapy on jet lag has never been my thing. 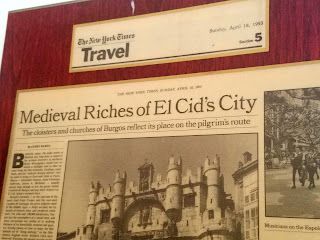 I arrived at Málaga airport at mid-day and, though I was tempted to try the well-regarded airport train into the city, I opted for a taxi that took me directly to the Hotel AC (Marriott) Málaga Palacio, where I. had never stayed, was an excellent choice. The Palacio is strategically located just steps from the old quarter, the Cathedral, the Picasso Museum and a slew of very colorful restaurants, almost all of which have outdoor seating and offer a broad array of traditional Malagan dishes. And straight down the Alameda---or just several colorful blocks winding your way through the old quarter--is Málaga’s wonderful 19th-century wrought-iron structured Mercado de Ataranzas with its 14th-century Moorish entrance portal. View of Málaga harbor and the SoHo district from the Hotel AC Málaga Palacios. As soon as I had done my arrival routine—check in, stack my indispensable compartmentalized eBags in the closet, shower and take a power siesta—I set out on a personal re-discovery tour of Málaga and its considerable attractions. I had until late afternoon of the following day to explore before the press contingent arrived and I would be tied to the communal schedule. Now, I had two main missions: I was eager to sample some Málaga tapas and to find a good haircutter. Mesón Cantarranas (The Singing [i. e., Croaking] Frog), Málaga. About ten minutes from my hotel, I wandered into Calle Sánchez Pastor, a pedestrian passageway with a cheese shop, three side-by-side restaurant/tapas bars—Mesón Gibralfaro after the fortress on the hill overlooking Málaga), Mesón Cantarranas (The Singing [i. e., Croaking] Frog) and El Mentidero (a typical bar where citizens traditionally gathered to share “oral journalism”--gossip, rumors, tall tales, etc.) and Bingo!, the F & C Barber Shop directly across the passageway! 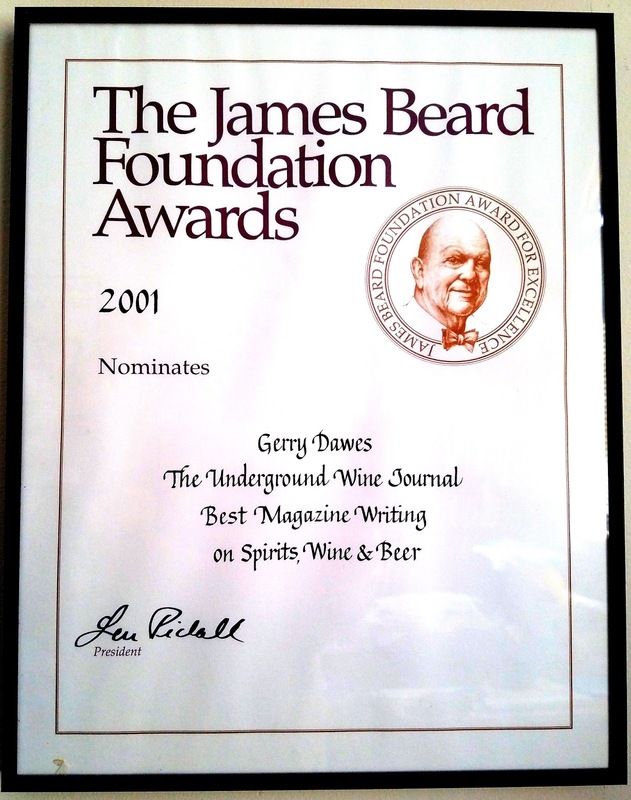 In this passageway street, I could get tapas and a trim, not necessarily at once. I looked into the barber shop to assess whether those being shorn were getting decent haircuts, told one of the haircutters to save me a space, then crossed the street for some tapas, hoping not to get shorn by the waiter out front who seemed intent on hustling any passing tourists into Mesón Cantarranas. I struck up a conversation in Andalusian-accented Spanish, establishing that I was not just any guiri (a popular term for a foreigner), and learned that I was dealing with Pepe. At the Cantarranas bar, from Pepe--now inside doubling as the bartender-and-tapas server--I ordered a glass of a Navarra Rosado (rosé)to go with the house croquetas (half dozen crisply fried alternating round bacalao and slightly elongated ham croquettes) and a big pork albóndiga (meatball) in a well-flavored sauce on a bed of fried potatoes. I also ordered alcachofa a la montillana, half an artichoke with jamón serrano and onions braised in Montilla (a sherry-like wine from Montilla in the neighboring province of Córdoba). 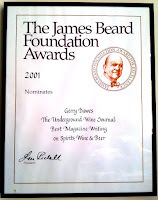 To test my thesis that alcachofas (artichokes) (and esparragos/asparagus) go best with sweet wines—since dry wines clash notoriously with both these veggies--I ordered a glass of Andresito Pedro Ximénez. The Andresito PX, made in the hills behind Málaga (Denominación de Origen Sierras de Málaga), was too cloyingly sweet, but it worked well enough with the artichokes to make me want to try them with a better, less alcoholic version of a Málaga wine, perhaps a Moscatel. 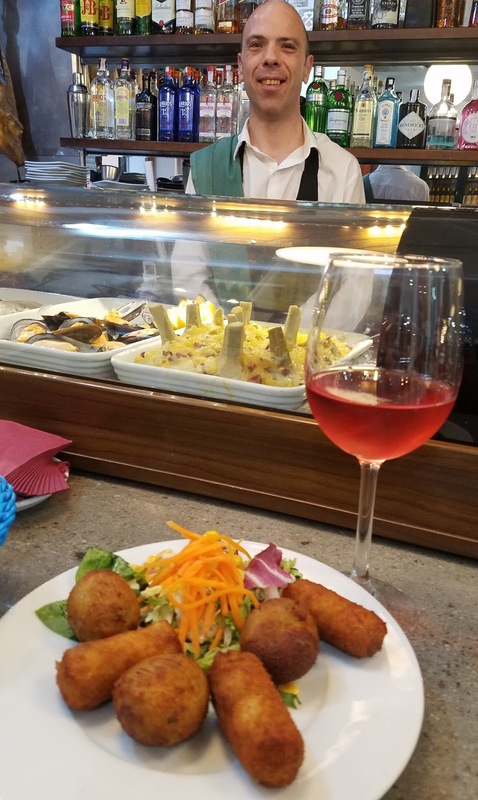 At the Mesón Cantarranas bar, from Pepe--now inside doubling as the bartender-and-tapas server--I ordered a glass of a Navarra Rosado (rosé) to go with the house croquetas (half dozen crisply fried alternating round bacalao and slightly elongated ham croquettes. I paid the bill, getting only slightly shorn, and crossed the street to see Paco, the barber, who gave me a decent haircut indeed. I did not try the tapas at El Mentidero next door, since Pepe at the Singing Frog told me that both were owned by the same person, but after my haircut I did duck into the adjacent Mesón Gibralfaro in spite of the interior tiled archway painted with a large inscription “Se prohibe el Cante” (no singing), meaning I was not likely to hear any spontaneous flamenco breakouts. I ordered another rosado and a favorite dish, salpicón de mariscos, a seafood salad of shrimp, squid pieces, imitation crab, tomatoes, onions, vinegar, which at Gibralfaro was disappointing, so I lamented the prohibition against flamenco singing even more. Getting a haircut from Francisco "Paco," one of the barber's at F & C Barber Shop in Málaga, just across the street from Mesón Cantarranas on Calle Sánchez Pastor. Calle Sánchez Pastor is just off the Pasaje Chinitas, the location of the mid-19th-to-20th century flamenco café-cantante Chinitas made famous by Féderico García Lorca in his poem-song Café de Chinitas and part of the reason Málaga was known as “a wild city.” The wildness has gone out of Pasaje Chinitas. Now, it has several bars and outdoor cafés, none of legend, but the colorful, emblematic flamenco-and-bullfighter Restaurante El Chinitas is in two renovated 19th Century buildings just a short block away from the former location. En el café de Chinitas, Dijó Paquiro a su hermano, Soy mas torero que tu y mas gitano. Paquiro told his brother, I am a better bullfighter and more gypsy (than you). This bull must die before 4:30 this afternoon." El Chinitas has a long bar with a range of good tapas on display under glass in refrigerated cases right on the bar. 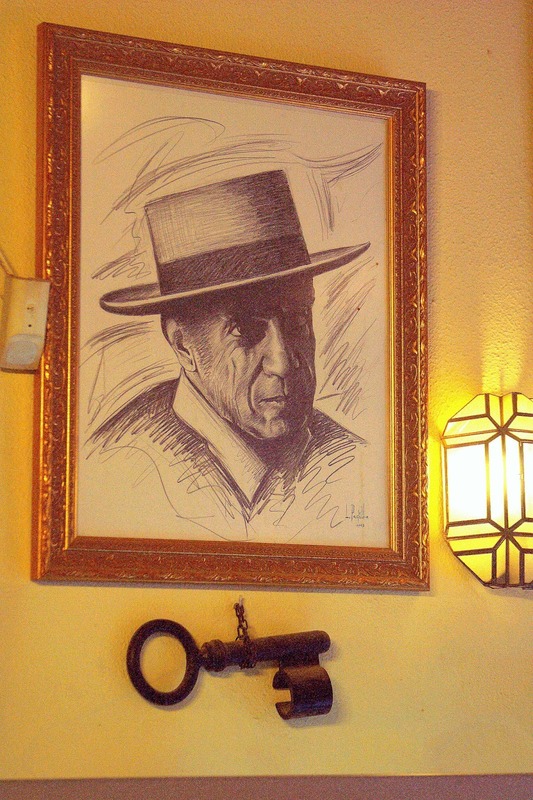 Its dining rooms are decorated with some wonderful oil paintings of Andalusian and flamenco scenes. And Chinitas still has some frisky flamenco and dance parties, especially during the Feria de Málaga in August. There is a painting in the main dining room of El Chinitas of three generations of legendary toreros: Cayetano Ordoñez, who was the model for Pedro Romero in Ernest Hemingway’s The Sun Also Rises; Cayetano’s son and great friend of Hemingway, the legendary Antonio Ordoñez, who 35 years after the publication of The Sun Also Rises, was the subject of Hemingway’s Life magazine series The Dangerous Summer (published in three parts in September, 1960, the subsequent book published posthumously in 1985). The two younger matadors in the painting are Francisco Rivera Ordoñez ‘Paquirri’ and his father Francisco Rivera Ordoñez ‘Paquirri’. 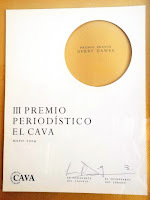 Fran Rivera is the grandson of Antonio Ordoñez and son of Antonio’s daughter Carmen and Francisco Rivera ‘Paquirri,’ a famous matador killed by a bull in the Plaza de Toros at Pozoblanco (Córdoba) in 1984. 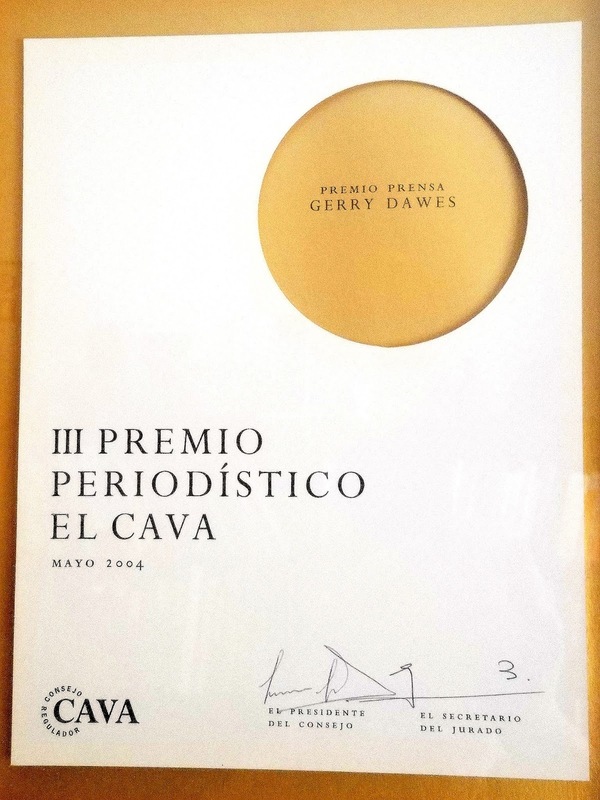 Ernest Hemingway spent a lot of time with Ordoñez in and around Málaga when he was writing The Dangerous Summer in 1959 and 1960 (and, incredibly, at an estate a few miles from the city shot a cigarette out of the bullfighter’s mouth as a stunt). A focal point of Hemingway’s The Dangerous Summer was the great mano a mano in 1959 between Ordoñez and his brother-in-law matador Luís Miguel Dominguín in Málaga's La Malagueta bullring, just half-mile east of Restaurante El Chinitas, a pleasant stroll past the Málaga Palacio and along the palm tree lined Paseo del Parque. 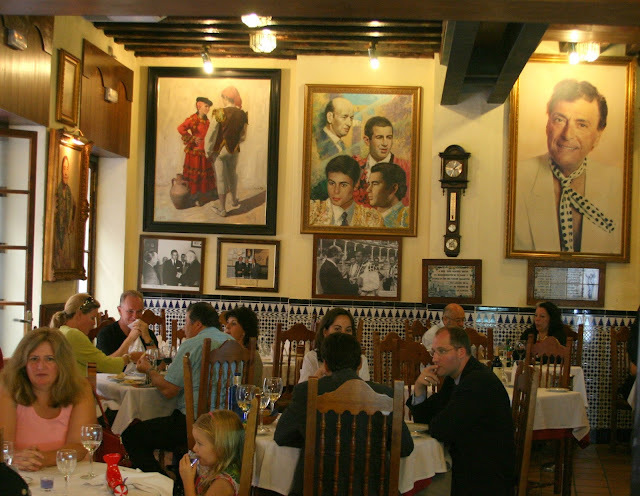 At El Chinitas, the extensive menu offers a broad selection of traditional Málagan and Andalucian specialties. At the bar I ordered a good Spanish draught beer and a sequence of three well-made media-raciones (half portions) de tapas: habitas con jamón (baby fava beans sautéed with diced jamón serrano), habas con calamaritos en su tinta (favas with baby squid in squid ink) and hueva aliñada (rounds of cooked merluza-hake roe, cooled, sliced and dressed with chopped tomatoes, bell peppers and onions in extra virgin olive oil and vinegar). 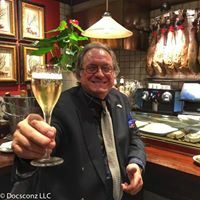 I ate my tapas, wistfully looked at the painting of the Ordoñez bullfighter clan, all of whom, except the elder Cayetano, were friends of mine during my lost youth (and for a brief return to follow Francisco Rivera Ordoñez in my lost middle age) when I followed the bulls around Spain. Habas con calamaritos en su tinta (favas with baby squid in squid ink) and hueva aliñada (rounds of cooked merluza-hake roe, cooled, sliced and dressed with chopped tomatoes, bell peppers and onions in extra virgin olive oil and vinegar) at El Chinitas. I wandered around the old quarter for a couple of hours, scouted a few more tapas bars and took a lot of photographs, then feeling the effects of the all-night flight from New York, I went back to the Málaga Palacio Hotel to the 15th-floor terrace restaurant. 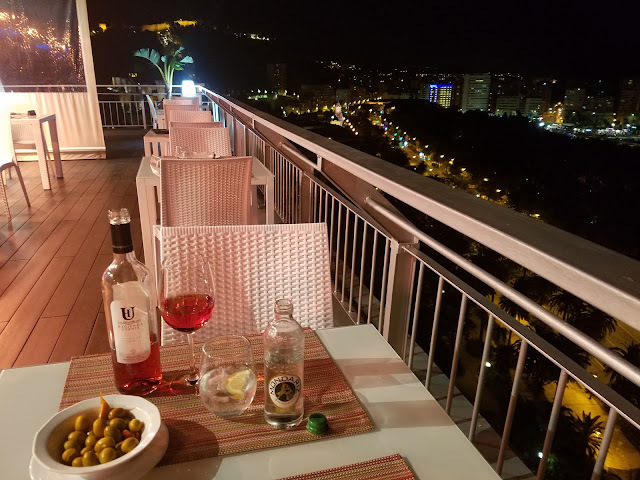 I took a table overlooking the palm tree-lined Paseo del Parque and the port of Málaga, ordered another rosado and some olives and contemplated what I was going to see the following morning. The Mercado de Atararanzas was first on my list, then a copita of hopefully better vino de Málaga from one of the barrels at the colorful Antigua Casa de Guardia (f. 1840). 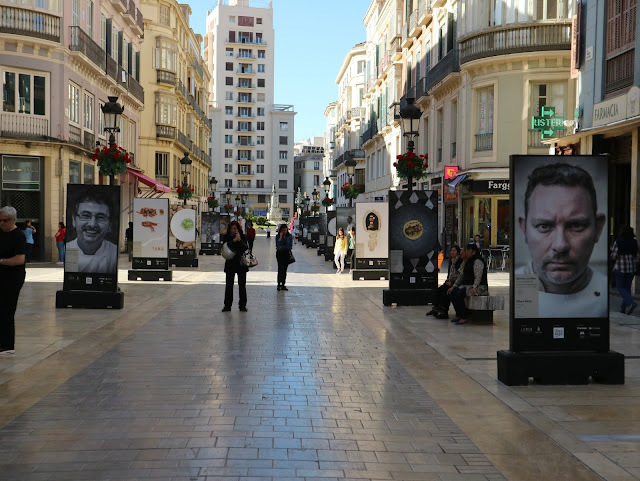 I had spent just half a day in this compelling city and was excited about filling the gaps in the forty-year bubble in my Málaga learning curve. 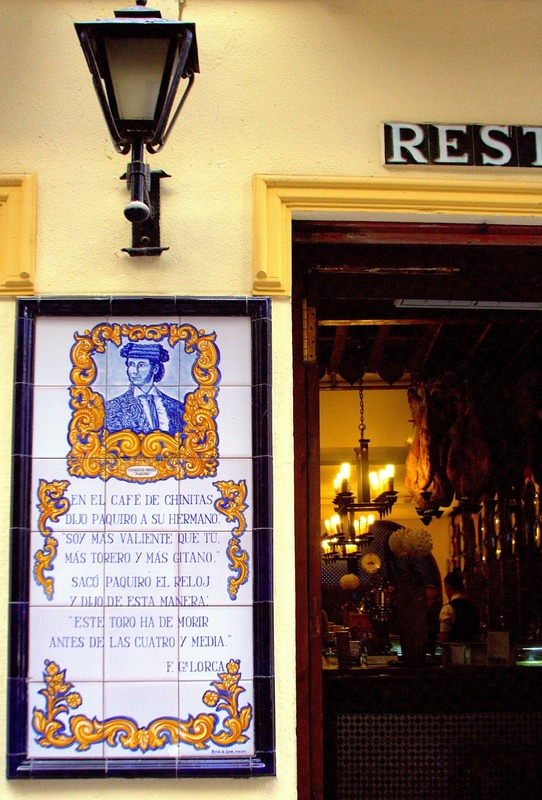 This is a photograph of a painted tiles of el Cenachero on the façade of Restaurante El Chinitas in Málaga. ("Victorian anchovies," named for Málaga´s patron, la Virgen de Victoria, whose day is September 8, which supposedly coincides with the peak of the Málaga anchovy season. "Vitoriano" is typical of Andalucian dialectical pronunciations, dropping a letter, in this case the 'c' in Victoriano." 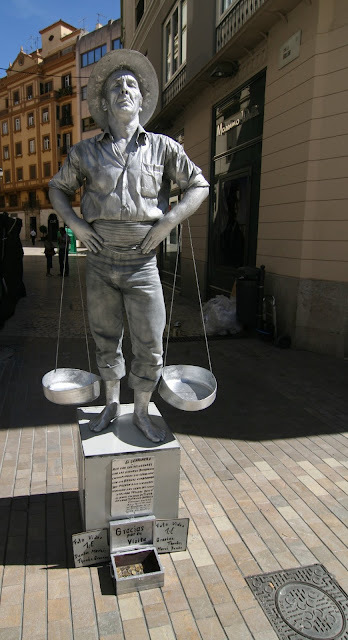 El Cenachero, a human statue street performer and a depiction in tiles at Restaurante Tormes of the young men who brought boquerones, anchovies, for which Málaga is famous, up from the sea each day in cenachos (baskets), which were hung from cords wrapped around their arms just above their elbows. 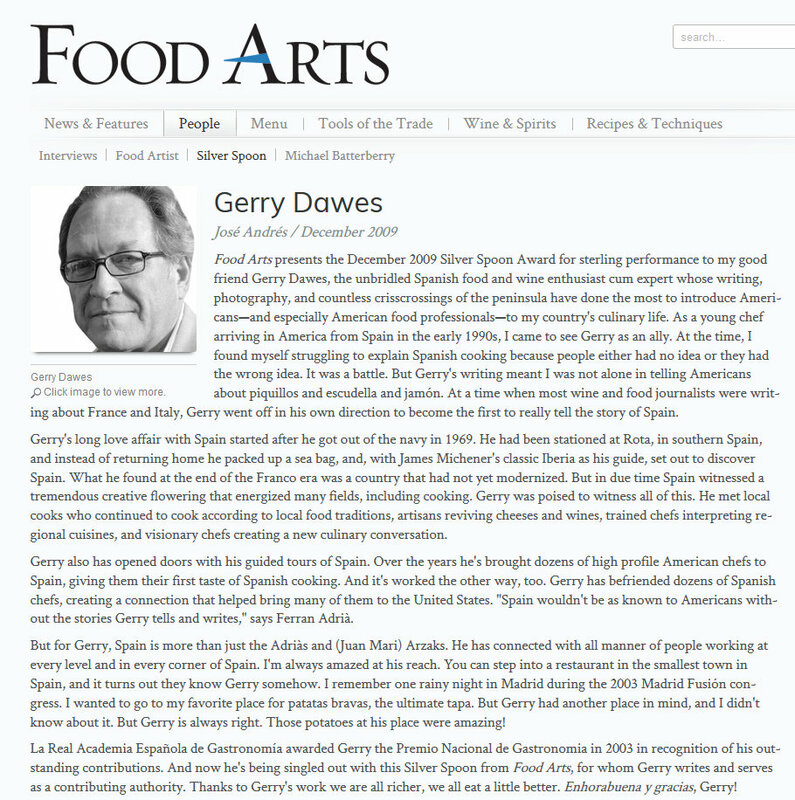 Málaga is so famous for its anchovies that people from Málaga are known as "boquerones. El Biznaguero, one of the unique symbols of Málaga, painted on tiles at Restaurante El Chinitas. Biznagueros were (and sometimes still appear) sellers of bunches of jasmine flowers picked in the mornings before they open and each flower speared one-by-one by hand onto the spikes of a dried thistle head on a stem. Then the stems of the jasmine-impaled spikes are imbedded into an agave leaf, as a carrying platform for the biznaguero and sold in the streets of Málaga. Not only do the jasmine flowers, first introduced by the Moors, smell seductive, they are said to ward off mosquitos. The image of the Biznaguero and that of El Cenachero, the fish seller are the two great and beloved folkloric symbols of Málaga. Self-portrait at Mesón Cantarranas, Málaga, of me on the right in the street in the background in front of F & C Barber Shop, Calle Sánchez Pastor, and the image on the left on the mirror is a from a famous photograph of an old-time biznaguero, seller of bunches of jasmine flowers picked in the mornings before they open and each flower one-by-one is speared by hand onto the spikes of a dried thistle head on a stem. Then the stems of the jasmine-impaled spikes are imbedded into an agave leaf, as a carrying platform, and sold in the streets of Málaga. Not only do the jasmine flowers, first introduced by the Moors, smell seductive, they are said to ward off mosquitos. The image of the Biznaguero and that of El Cenachero, the fish seller carrying two baskets of fish (usually anchovies and/or sardines) suspended from a bar across his shoulders, are the two great symbols of Málaga.